Persian and Oriental Carpets - Kilim World Скъпи клиенти, празничното работно време на Килим World е както следва: 26 април (петък) и 27 април (събота) 11:00ч. – 18:00ч., 28 април – 1 май ЗАТВОРЕНО. От 2 май (четвъртък) сме с нормално работно време от 10:00ч – 19:00ч. Килим World Ви пожелава Весели Празници++++++Dear Customers, holiday working hours of Kilim World are as follow: April 26 (Friday) and April 27 (Saturday) 11:00 – 18:00, April 28 – May 1 CLOSED. From May 2 (Thursday) we are back to normal hours 10:00 – 19:00. Kilim World wishes you Happy Holiday! Ръчно изработени текстилни изделия, подбрани от различни провинции на Иран. Един от символите на персийската култура, със запазените до днес древни технологии на тъкане и връзване, притежаващи изкусен дизайн. Изработката е ръчна, материалите са естествени (вълна, памук, коприна), багрилата са растителни или минерални. Персийски There are 975 products. Ziegler are Painted Persian Rugs, which makes them a bridge between the classical and the modern style. Their colours are usually crayon-like and softer than the typical oriental carpets. Largely prefered by collectionists. Kazak rugs are hand-knotted in the Caucasus region. They posses geometrical figures. The Nomad rugs are hand-knotted and one of first examples for them come from the Baluch tribe, inhabiting the area near the border between Iran, Pakistan and Afghanistan. Some of the oldest motifs and culturistic ideas are put into the Nomad and Rural rugs. Bukhara is a city museum with more than 140 monuments, located in Uzkebistan. Every rug in general inherits its name from the city they've been made, and these rugs are easily recognizable with their motif "elephant footstep". The motif is believed to bring luck and happiness in Your home. Some of the Bukhara rugs in our gallery come from different parts of Pakistan, once belonging to the Turkmens. The dyeing of the wool is natural with plants. High quality rugs from afghanistan, hand-knotted in small family factories from high-grade wool. The colours of these carpets are mostlz red and black. In some motifs the masters they have been known to use the wool's natural colour (beige), and the motfs'depictions are octagons. Very strong rugs, and are easy to clean. The Mir rugs are a classic, hand-knotted oriental pieces from Persia (Iran) and India with high quality and resilience. They're characterized with unique motifs, strong pile and longevity, all satisfying criterias when buying a rug. The evenly distributed knots, concerning knitting, allow the making of such rugs to be in different sizes, while the same rare motif combinations are kept. In this section You can find original Herati and Bidjar rugs from Iran and India. The original Bidjar rugs are hand-knotted in the Iranian city of Bidjar, and in the outscirts around it, which belong to the Kermanshah Province. 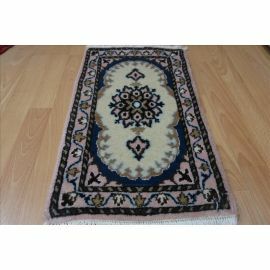 The far side of the rugs are made from cotton and the rest is made from expencive kurdish mountain wool. The Herati rugs possess exceptional beauty and bring comfrom and peace to Your home. Bidjar and Sanadij are the two cities in Iran, that produce the most rugs since XVIII sentury. The Bidjar rugs are distinguishable with the fact, that the masters use wet materials, and after the threads and knots have dried are tied with a double knot (persian knot). That makes the rug exceptionally strong. Their colours are profound and are mostly in light and dark blue or pale red. Between the cities of Isfahan and Tehran, near the edge of the Dasht-e Kavir desert, lies the city of Kashan. Famous with the making of high-quality rugs. In the XIX century Kashan is amongst the biggest manufacturers in the world. The rugs are hand-knotted, with the use of the double (persian) knot. The pile is wool, the warp is cotton. Their motifs depict beautifly formed medallions, trees and floral shapes of all kinds. The dominating colours are red and beige. This rug is hand-knotted in the Mashad capital, Khorosan Pronince, North Persia. The motifs often include dark-blue medallions and nuances of blue, and the wool is mellow. The Mashad rugs are close to the Kashan design. Approriate for every house. Sarouk is a type of Persian rug and are woven in the small village of Saruk and the city of Arak, Markazi Province, Iran. The colours are mostly in the dark spectrum and the overall design usually does not include a medallion, or if it does, it'll be a small one at the center. These rugs are woven from high-quality wool with Persian (double) knot. While the Persian rugs inherit their names from the region, in which they've been made, the chinese ones inherit their names based on the ruling emperor at that time. The oldest remaining rugs of this type are from the Chun Chen emperor era, who is also the last emperor of the Chen dinasty. Our chinese rugs are with the typical for their culture symbols and ornaments, but are hand-knotted in Iran, and the used materials are all natural. The city of Moud is located south of Mashad i Birjand, the southern Khorasan Province, Iran. This area is famous with its rugs called Moud, typically possessing a curviliniar design with images of small flowers and a medallion at the center. Hand-knotted rugs from high-quality materials. These rugs keep their value, because of their high number of knots and their motif, originating from the personally preferred design of Shah Abbas I. The Indian rugs are famous with their thichness of weaving, and are well known with their realistic and detailed designs. The rug making in India is most evolved in the northern parts (Kashmir, Jaipur, Agra and Bhadohi). Samarkand is one of the oldest cities of Ancien Persia, located today in Uzbekistan. It is said that the city has been found somewhere between VII and VIII century BC. In modern times, the exceptional beauty, richness and art of the buildings in the city are depicted on the rugs themselfs. Multicolored rugs usually possessing the Tree of Life and pomegranate seed, which is also considered to be the seed of life. The Ariana rugs are a part of the Samarkand family. A wonderful completion for every home.